I don't know about all of you, but when I'm reading the Harry Potter books and picturing butterbeer, I'm thinking of a warm, caramel-color drink. In a moscow mule mug. I have no idea why this is the image in my head, considering "beer" isn't hot. And yet, that is the image in my head when I see Harry, Ron, and Hermoine scheming over mugs of the stuff at the Three Broomsticks. Did I just imagine it? Apologies, as it has been several years. Abe and I have been back to Harry Potter World 3x (we have an annual pass) since our first visit in April. But this is our first time actually ordering butterbeer. Usually the lines at the stands are super long. They seem to be shorter now. You can get the drink cold (like a soda) or frozen (like a slushie), with a sweet creamy foam on top. We opt for the latter, in a regular cup instead of the collectable mug for $6 more. It is non-alcoholic, even though I remember some house elves getting tipsy on the stuff in the books. Abe and I recommend drinking it straight from the cup, rather than the straw, so you get to experience the cream in addition to the drink. Plus, you'll wind up with a fun little mustache. It tastes a lot like cream soda to me. I'm not really a cream soda fan. Let's leave it at that. Upon doing a little research for this blog post, I discover that they DO indeed serve a hot version - at least, they do at the Universal Studios Orlando. I wonder if when the weather gets colder in Los Angeles, they'll start offering it. Most likely not in a moscow mule mug. 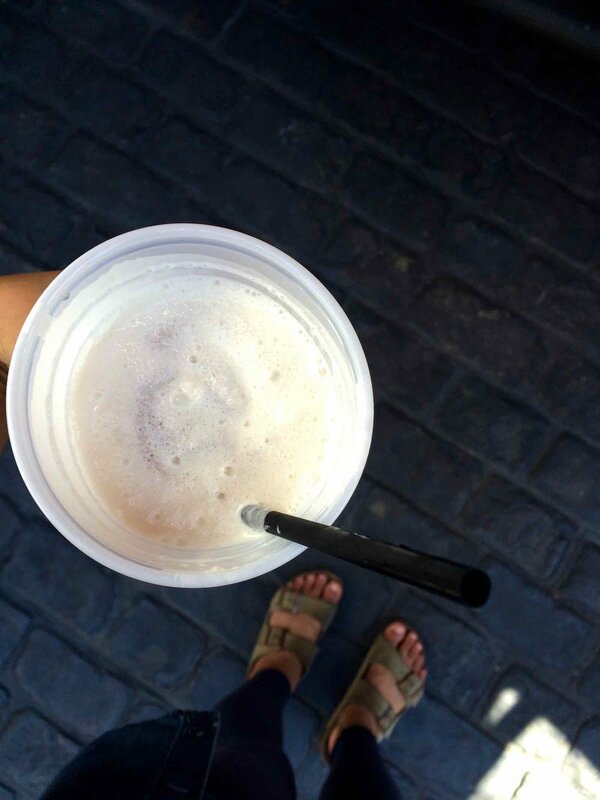 In the meantime, here's a few butterbeer recipes I found to make it at home: Sandra Lee's version, a vegan one, and a copycat of the theme park version.